Verdek’s Galileo Cryobox® offers all the capabilities of a large LNG plant in one mobile compact module. The Cryobox® shares the same basic features and characteristics as all the other Galileo packaged compression systems and design principles such as modularity, light weight, mobility, and ease of installation, operation and maintenance. Enjoy the LNG revolution through Galileo’s superior and proven technology. Galileo’s Cryobox® is the first liquid natural gas plant to apply the concept of modularity to LNG production. It is both a revolutionary innovation and significant improvement over non-scalable, single-unit solutions for growing operations. Yesterday’s barriers to LNG conversion such as heavy initial investment or technological concerns are no more. LNG is now a viable low-cost and low-CO₂ substitute for diesel and fuel oil. Moreover, with the Galileo Cryobox®, you can be your own LNG supplier. With scalable capacity and production, you can customize your own LNG needs, with daily outputs of up to 10,000 gallons. The Cryobox® high-pressure thermodynamic cycle converts natural gas into liquid by cooling its temperature below -153 °C. This multi-stage compression process includes an automatic boil-off recovery system that eliminates the venting that was needed with conventional LNG storage. This innovation produces LNG very efficiently and in compliance with all safety and environmental protection requirements. Since it does not require any prior civil engineering work, such as the construction of a perimeter bunker, Cryobox® is ready to be shipped anywhere on a single trailer for immediate use. 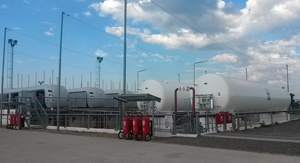 Due to its packaged configuration, it can be installed at a fueling station and then connected straight to a gas distribution pipeline. When installed at the wellhead of a natural gas field, the Galileo Cryobox® transforms polluting gas-flaring into value-added liquid fuel. The Cryobox® monetizes your waste products in an environmentally friendly way without the need for additional pipeline infrastructure. As Cryobox® turns LNG into an available and affordable source of clean fuel, you may move even further away from traditional fueling infrastructure. Compared to any other diesel substitute, LNG has a higher energy density, which means lower fuel costs and more distance from the same tank. LNG is the cleanest, most efficient alternative fuel for fleets of long-haul trucks and buses, ships, barges, ferries, trains, or any vehicle traveling long distances and to places where fueling stations are widely scattered. When natural gas consumption levels do not justify the investment of a conventional pipeline, the Cryobox®, in combination with Galileo’s Virtual Pipeline®, can provide a ready supply of LNG fuel for remote industrial facilities, mining operations, or distant communities, even further than 250 miles away. The Virtual Pipeline® enhances the capacity of the Cryobox and optimizes LNG transportation costs, delivering more BTUs than CNG and ensuring profitable economy of scale for your business. After reaching the required BTUs scheduled in a regular LNG production plan, the Cryobox® is also able to produce up to 80,000 standard cubic feet per hour of CNG for fleets or for retail fueling, allowing for maximum uptime and additional revenue. The Galileo Cryobox® offers this dual-mode capability without the installation of additional CNG compression components. Scalability: installation can grow according to demand changes. Intrinsically safe with an explosion proof casing.